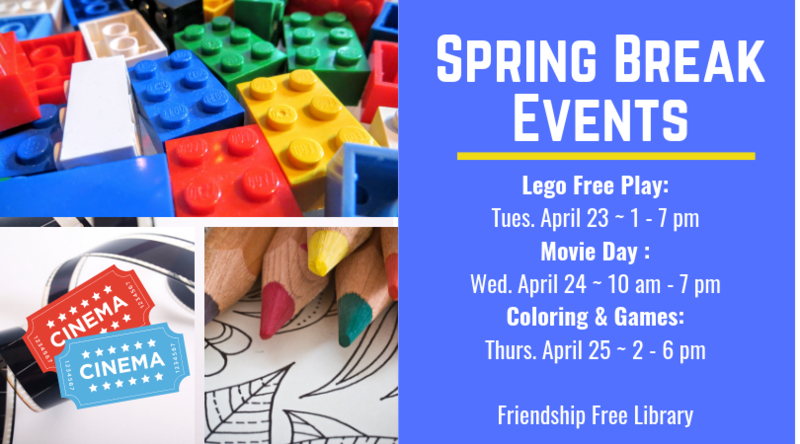 All day Tuesday, April 23 from 1 – 7 pm, if you’re looking for something to do with the kiddos during Spring Break, stop by the library for lego freeplay. All day Wednesday, April 24 from 10 am – 7 pm if you’re looking for something to do with the kiddos during Spring Break, stop by the library for a movie marathon. Come for one movie, or come for all of them! On Thursday, April 25 from 2 – 6 pm if you’re looking for something to do with the kiddos during Spring Break, stop by the library for coloring and games. We have several giant games to play, including connect 4, checkers, jenga, and even playing cards!